I get asked a lot on how I find my photo spots. I live in an old college town that straddles the line between modern and historic, bustling and rural, so the juxtaposition of all these elements helps provide different opportunities. 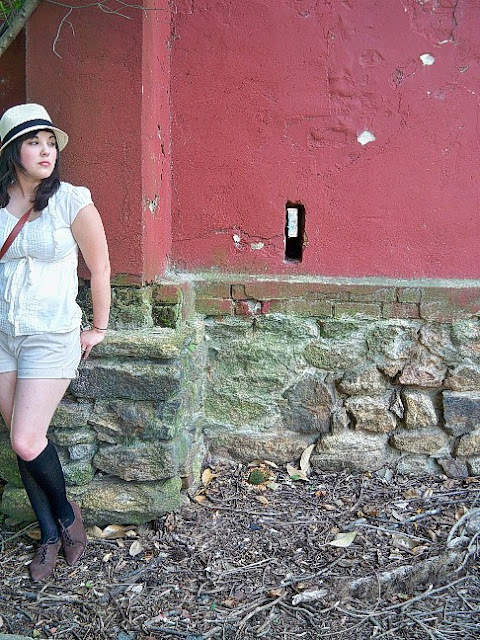 However, some of my favorite places to take outfit photos are considered everyday occurrences --- places that seem very ordinary until they're looked at closely through a camera. Let's go ahead and get this one out of the way, since it's probably one of my most used places. I love going into a forest because it's usually very beautiful, scenic and can add elements of outdoorsy-ness and mystery to any photo. Bonus: You might start channeling your inner Ansel Adams and develop an interest in wildlife photography. What's great about this place? They're a dime a dozen just about anywhere, so you probably won't have to trek too far to get to one (you might even be parked in one right now). 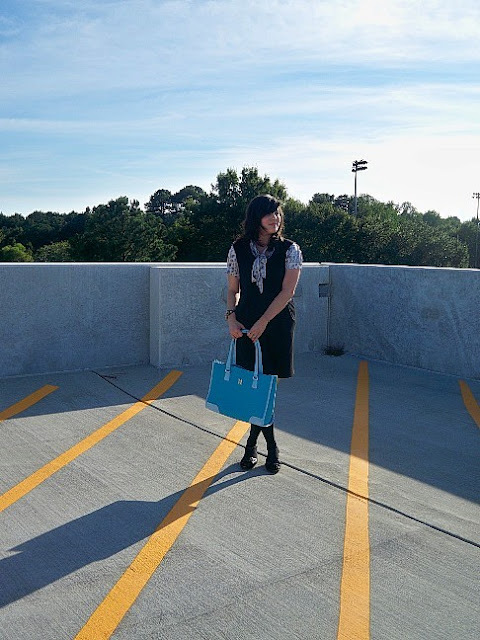 Parking decks, particularly the top floor of one, offer beautiful views of the sky and the street, and the clean, neutral lines can be complements to what you're wearing. Bonus: the top floor of a parking deck is usually very secluded, so you can privately take your photos. In our fast-paced modern world of iPads and twitter, sometimes it's just really nice to turn down the scenic route and enjoy the country. 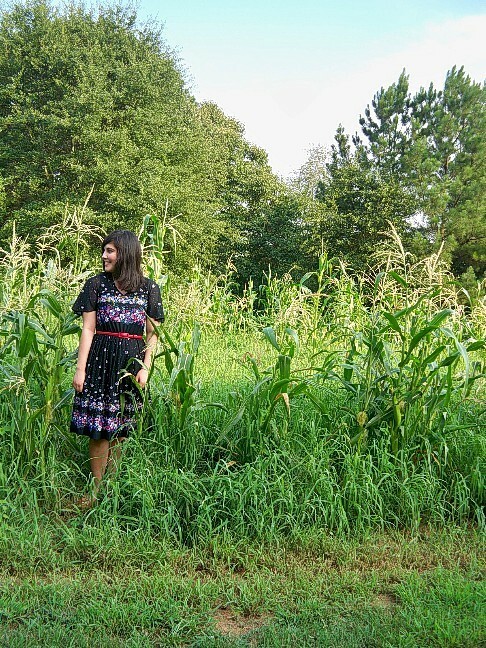 Some parts of my state are really rural, so it's fun to leave my bustling town and go play near a farm and take outfit photos (see evidence in my farm park photos here). Rustic areas such as farms, fields and orchards are not only exciting to visit, but they're visually interesting. Go find an apple orchard, pumpkin patch, mountain view now --- fall is one of the best times to go visit because of the beautiful colors. 4) Near bodies of water. As humans, we're naturally drawn to sources of water. It's a place of action and renewal. As a photo spot, the natural colors and geometric lines can offer beautiful composition in your shots. Be it stream or lake, pool or sea, have fun taking photos near the water. And don't forget to visit repeatedly -- seasonal changes to the water can offer lots of visual interest whether it's summer or winter. Every town has that nugget of information that puts it on the map, whether it's a battlefield, an old factory or a 200-foot statue of a peanut. These historic milestones and quirks are what make towns unique, and they are interesting to document in photographs (outfit-related or not). And history doesn't have to be stuffy, either: my photo above was taken at an old church steeple where REM played their first-ever show more than 30 years ago. Oh, railroad tracks. They're practically runways when you think about it. Manmade, industrial runways. Just be careful and use your judgment: Try to use a part of the track that's in a safe part of town, and don't actually be on it when a train's a-coming. Spill: What's your favorite place to take photos, and why? These are some of your best posts. I was happy to see you're posing one made the IFB links a la mode because I was going to suggest you submit it! I love pictures in front of interesting doors. They always have a neat texture or color that adds a lot. I really enjoy it when you make posts with tips for blogging, you do it really well and it's quite helpful for beginners like myself! You always have the best posts! I love them :0) It creeps me out when people do cemetary posts though! great post! 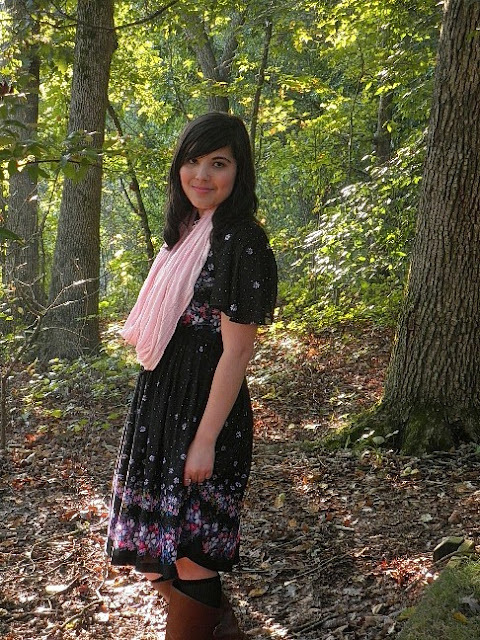 I am totally inspired now:) I like to take pics near trees cause its a great natural prop! you ideas are great! 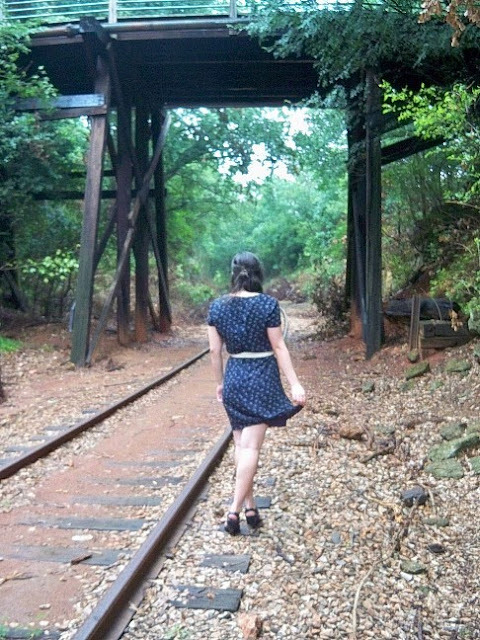 I just discovered railroad tracks taking pics for a friend. Can't wait to incorporate them in my blog. Oh I luuuuuuuuvs this post!! 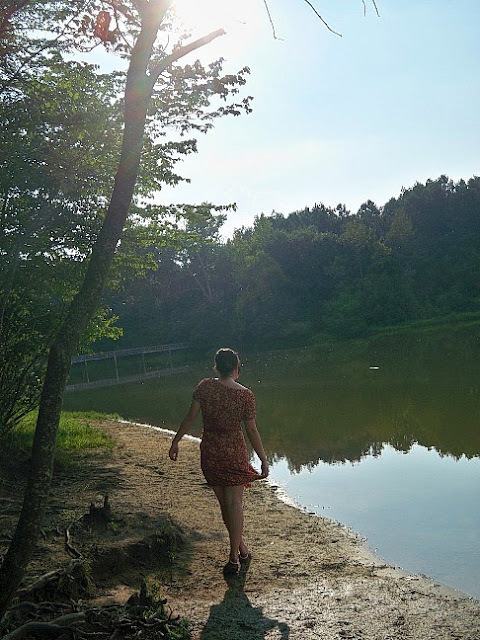 I moved to a new town about a month ago so I've really struggled finding secluded spots to take photos so these are GREAT tips. Currently my new fave is a community garden (my camera loves flowers&trees!). Great post! Thanks for sharing your ideas. This is a really great post! I just started taking outfit photos, so I haven't really made the time to explore locations, and I'm still just trying to get comfortable with taking pictures of myself and being okay with the fact that people can see me. I live in a big city, so finding interesting (and fairly private) places to shoot is a bit problematic, but I should definitely try out the parking deck! At this point, I've been using my balcony, but I'm hoping to be able to do something more visually interesting in the near future. I love to take photos in the woods or where there are lots of trees or plant life or bodies of water. this was so cute and informational. These are great tips!! I wish I had more time to get to some other places! It is interesting to see how places change when you start looking at them through a camera's lens. Places that seemed commonplace in my neighborhood, now seem artsy and poetic. Thanks for this pos! It is so helpful1!! Great ideas! I get stuck in a rut taking outfit photos (i.e. I tend to stick to my own backyard). I'm going to have to try a few of these and branch out. and ps. I LOVE that first dress you are wearing in the woods shot. oh, fun! Good ideas. I'm just glad I'm not taking mine against a blank wall in my bedroom anymore, lol! Yours are always so fun. Thanks for sharing these timps!! I love these tips. . so often do we search relentlessly for good spots! My favourite is by the beach. . or in a derelict-looking place, but I think I'm converting my living room into a photo set. . Thanks so much for consistently offering creative and helpful posts. The tips you offer will serve us well! Great, great tips! I especially love the parking decks... one I easily, VERY easily overlook! Thank you for making me think about the places around me a little bit more closely. I can't tell you how excited I was to know that's the REM church you're standing in front of - I'm a huge fan! I also love the parking deck suggestion - I'd never have thought of that, but there are a couple in our town that have great views, and you're right, sometimes that "blank canvas" kind of look can be perfect for photos! Great post :) I've never thought to go to a historical sight! I always take photos in my house and I have a woods right outside my front door. gorgeous photos each and every one. it seems what they all have in common is great textures and lines of interest, each place evokes a mood. i usually end up in the back alley behind my house. it is run-down, but i love the weediness of it all, there's always something blooming or happening, and the patina of the fences, the concrete juxtaposes wonderfully with whatever happens to be growing there. bodies of water: that's my next goal, thanks to you.